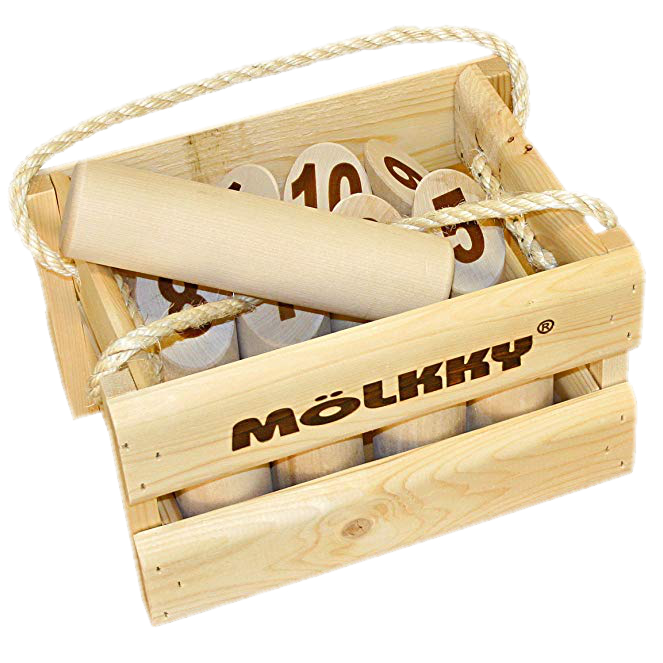 Throughout the years, a general consensus has been established on the details of the Mölkky game rules. What follows are the rules that have been agreed upon by most of the officially recognized Mölkky associations and federations. An authentic Mölkky game is made from birch wood. The 12 numbered pins are 15cm (5.91inch) high, flat at their base and bevelled (45°) at the top. Their diameter is 5.9cm (2.3inch). The pins are numbered from 1 to 12 on their bevelled part. The throwing pin is 22.5cm (8.6inch) long and is also 5.9cm (2.3inch) in diameter. At the beginning of a game, the pins are placed 3.50m (11.5 foot) away from the players (see image above for pin formation). When a pin has been knocked down, it is stood up again (without lifting it off the ground) exactly where it landed, with its the number facing the launching zone. This is how during the game the pins get scattered across the playing field. The mölkkaari (see image) is used to delimit the zone from which a player can throw the Mölkky at the numbered pins. The mölkkaari consists of four interconnected pieces of wood, each 24cm (9.45 inch) long, 3.2cm (1.26 inch) wide and 1.8cm (0.71 inch) thick. The positioning of the mölkkaari on the ground is trapezoidal (the two lateral pieces are bent 45° toward the players). Each throw must take place from behind the mölkkaari, without touching it. The playing field is delimited by lines. These lines are considered to be indicative only, which means they can have no effect on the scoring system as explained above. They exist only for practical reasons - to prevent pins from mixing with other games nearby. Pins that were knocked outside of the playing field are stood up again within the playing field, perpendicular to where they landed and at a Mölkky’s length from the border of the playing field. The players (or teams) each play in turn, trying to knock down numbered pins by throwing the Mölkky from the launching zone. All throwing styles are allowed. A pin is only considered knocked down if it has fallen entirely to the ground. If a pin is in equilibrium on another pin, the Mölkky or a natural piece of land (tree stump, tree trunk …) it is not considered as knocked down. If the pin rests against an artificial element (cement border, a bench, …) it is considered as knocked down. The winning player is the first to reach exactly 50 points, thereby ending the game. If a player's score exceeds 50, it is set back to 25. A player that misses all of the target pins three times in a row is eliminated from the game. In case all players are eliminated before anyone reaches 50 points, the last remaining player wins. A Mölkky battle generally takes place between two teams in a best-of-three setting. A draw (coin toss) determines which team starts the first round. After two rounds, in the event of a one-round tie, each team adds their points from both rounds. The team who scored the most points starts the third and final round. In case of a tie, there is mölkkout. Mölkkout is a means of appointing a definitive winner between two teams with the same number of points. In mölkkout, the pins 6, 4, 12, 10 and 8 (in that order) are initially placed one after the other, with a distance of the Mölkky’s length between them. The first pin (number 6) is placed 3.50m (11.5 foot) away from the launching zone. When a pin has been knocked down, it is stood up again at its starting position. As usual, knocking over exactly one pin scores the amount of points that is marked on the respective pin. Knocking over two or more pins scores the number of pins that were knocked over. When all required throws have been executed, the team that scored the most points wins the mölkkout. If there is still equality in the number of points, each player gets another throw until one team has scored more points. If you intend to buy a Mölkky set, then Mölkky World recommends you to buy the “Luxury” edition on Amazon. It’s the best quality around and it’s also the official game set used in tournaments and championships all over the world. We recommend you to order your Mölkky set directly on Amazon, because you will find – in most cases – the best price for a Mölkky set on their website (taking into account that delivery is free of charge in most regions). Subscribe to our email announce list and receive a free pdf (544kB) on the history of Mölkky. Sign up to receive your selected communications from Mölkky World. You may opt out at any time.